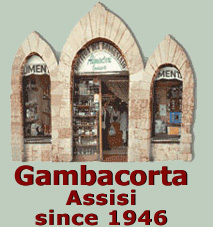 Grains and vegetables, fundamental ingredients in the typical Mediterranean diet, alone or in combination, occupy a top spot among the many Umbrian foods because of their protein and their nutritional value, for their appealing flavour, for their naturalness and for their antique tradition. 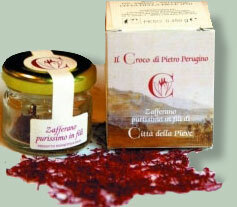 To the saffron, cultivated to "Città della Pieve" since the XIII century, the ownerships are recognized for not only tinging, or for cosmeticses, or for gastronomic but also exceptional such medicinal ownerships from believes a panacea for all the illnesses. Plateau are grown at a thousand meters in altitude where the soil and the ecological production method make the lentils excellent for cooking and give them an exceptional flavour. The Cannabis seeds have been being used for centuries in the human feeding, they constitute a precious nourishment thanks to theirs elevated contained of proteins, vitamins (above all E, B1, B2, B6) and fat acids polinsaturi, said Omega-3 and Omega-6. The flour of cannabis seeds can be used for bread's production, raised sweets and biscuits, also mixed in small doses to other flours. The cannabis oil is rich of nourishing and important substances for our health: vitamins, mineral salts, aminoacidi, fitosteroli and vegetable source of acid alpha linolenico, better known as acid of the serious Omega 3 - it must rigorously be used to raw - The oil drawn by the cannabis seeds is indeed a natural product from the extraordinary dowries. Omega 3-rich foods, such as nuts, flaxseed, algae and hemp seeds, help to meet the daily requirement of this essential fatty acid useful for vascular diseases, nervous system, vision and counter free radicals. 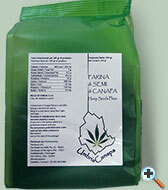 Sativa Canapa is an old renewable resource of primary importance for a sustainable future. It grows without herbicides and chemical fertilizers. Is a complete highly nutritional food. The combination of grains and legumes enhances the quality of the individual ingredients which are mixed in an even quantity. The soup makes an excellent total meal in the typical Mediterranean diet style. 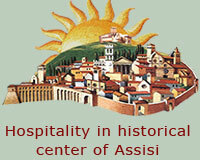 A grain that was used in ancient and Etruscan cooking is a healthy and easily digested food. The variety grown in the highland of Colfiorito is particularly wholesome as it is husked according to traditional strict standards. It is an excellent substitute for rice. The main ingredient in this tasty mix of herbs and spices is chili pepper, a food for ages considered beneficial for one's health. 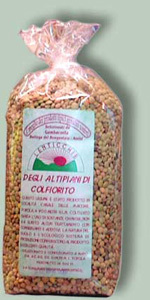 This mix can be used in cooking in many different ways, for pasta dishes, main courses or vegetable side dishes. Excellent for preparing pinzimonio (a dressing used for raw vegetables made of oil, salt and pepper). Are a tasty mix of herbs and spices that give that extra flavour to char-grilled meat, barbecues or grills. Orzo has been known for centuries for its curative powers now known to be due to its abundance of minerals. Orzo retains these properties even after it has been husked, making it a great substitute for rice (and cooks even more quickly!). Is an assortment of seven different varieties of dried grains and legumes and is ideal for preparing a tasty, nutritious and light soup in a short time. Corn flour cooked and enriched with truffles cut in pieces or pulverized is perfect for preparing delicious polenta in five minutes. Corn flour cooked and enriched with porcini mushrooms cut in pieces or pulverized is perfect for preparing delicious polenta in five minutes. The cicerchie, had been cultivating for ancient times, as the other vegetables are rich of proteins, glucidi, fibers; and the fats, that don't overcome 4%, introduce a rich composition of sour useful polisaturi in the prevention of the troubles cardio-circulatory. Before the cooking it must be held to bath for at least 12 hours and they are prepared as the other legumes. The Fagiolina of the Trasimeno, an extinct leguminosa since the first ones of the '900, thanks to the patient and assiduous job of some agriculturists and to the intervention of the Community Montana, is again produced where in the ideal grounds he developed. Legume of small dimensions and very thin peel it doesn't is necessary to soak it before the cooking. it is protected from Slow Food. It is the same product of the code CR7 but sfarrato, namely minced for those people that so prefer it. Ancient cereal already used in the kitchen etrusca, dietary food of easy digestion, particularly this variety produced in the highland of Colfiorito. Its principal characteristic is the power due antioxidant to the tall selenium content and acid fitico. Good substitute of the rice, is suitable in the alimentary diets. The quantity of an envelope is enough for 7/8 portions. The roveja (rubiglio and corbello are other dialect names) it is a legume of the past, in extinction but still cultivated in small piece of ground of some common in the Sibylline mountains park. It cooks as all the other legumes, alone or with the pasta. Rich of potassium, phosphorus, proteins, don't contain gluten and if reduced in flour it is used for preparing the Farrecchiata, an ancient special polenta to be cooked and to season as the polenta of corn. The same saffron of the cod. cr25 is manufactured in an original and it practises wrapping from five doses, each for four / five portions. 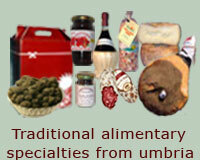 Every single container contains a traditional recipe for: rice, pasta, soup, fillet, chicken.